Jamie Miller is the paralegal for Haas Tharrington, P.A. She provides affordable paralegal services with professionalism and expertise. Prior to coming to Haas Tharrington, P.A., Jamie worked as a legal assistant in a general law practice. 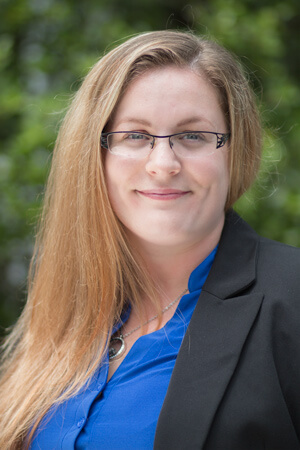 Jamie started in the legal field in 2010, and has since discovered her passion for family law. If you ask, “What is a paralegal?” Jamie demonstrates the skills and character of an effective paralegal. She works closely with the attorneys to assist clients throughout each phase of their cases. Jamie enjoys interacting with and being a resource for clients, and providing the legal support necessary for the attorneys to offer the best quality representation. Contact us at 919-783-9669 today to discover how we can help you with affordable paralegal services. Our paralegal services include conducting research, preparing legal documents, coordinating court-related matters and paperwork and writing reports to help our lawyers prepare for a case. As a paralegal, Jamie works closely with the attorneys at Haas Tharrington, P.A. and the clients to ensure the legal needs of the situation are met, whether it’s a separation, divorce, estate or adoption. Paralegals do not give legal advice. Instead, paralegals like Jamie perform duties such as extensive legal document research and preparation, court date coordination and file management. For example, during a separation or divorce, a paralegal can guide you through the many forms and paperwork required by the legal process. A paralegal can also explain to you what forms to file, and where you need to file them, for your legal case or requests to be processed properly. Additionally, paralegals can aid in filling out forms for requests to modify child custody or alimony. Jamie is a mother to three children and enjoys hiking with family and going on runs with her German Shepherd on the weekends.